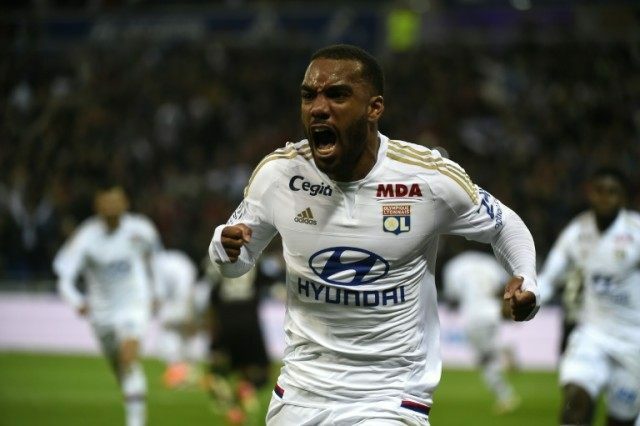 Paris (AFP) – Alexandre Lacazette grabbed a late equaliser as 10-man Lyon salvaged a 1-1 draw in the chase for second in Ligue 1 on Friday in a match stopped to clear up a snowstorm of ripped up newspapers. Nice took an 18th minute lead after Valere Germain beat a Lyon off-side trap while Lacazette prodded home in the 82nd minute after Mathieu Valbuana had hit the bar as the sides struggle to claim Ligue 1’s second automatic Champions League berth. Runaway champions PSG have 83 points. The result means Lyon remain second on 56 points after 34 games while Monaco are third on 55 ahead of their trip to Marseille Sunday and Nice are fourth on 54. Lyon had been cruising until Germain’s stunning header past Lyon ‘keeper Anthony Lopez riding on seven unbeaten games. And worse was soon to follow when promising midfielder Maxwel Cornet followed through with both feet to the Nice ‘keeper Yoan Cardinale’s chest. His straight red card in the 24th minute was fully deserved and Lyon were suddenly floundering after such a promising opening period. Nice star Hatem Ben Arfa was kicking himself for failing to convert two chances created by his own mazy runs and which could have lifted his side second had one of the narrowly wide shots hit the mark. The game will also be remembered for Portuguese ‘keeper Lopez insisting on helping with the clean up as gardening rakes and wind machines were brought out to clear an astonishing amount of ticker-tape, toilet rolls and ripped up newspapers. The match was stopped for around five minutes in the 70th minute as Lyon’s Parc Olympique had become unplayable. France forward Nabil Fekir also made his comeback from a knee ligament injury that sidelined him since early in the season and the 22-year-old played the last ten minutes. Monaco will be hoping to take advantage of the crisis in Marseille who are sitting 14th, just six points above the relegation zone. To add to the disarray Marseille owner Margarita Louis-Dreyfus announced on Wednesday that the club was now officially up for sale. PSG, meanwhile, return to domestic duty following their inglorious exit from Europe bidding to finish their season with dignity starting with Saturday’s game at home to midtable Caen.